IT WAS A gamble when Charles Small, YIISA’s director, established the center in 2007. He did so armed with a doctorate in philosophy from Oxford, engagement in social theory, experience in policy discussions in Canada, Europe, Israel, and the US, outside funding, and support from some Yale faculty and administrators. YIISA was to be a research center devoted to examining the history and nature of contemporary anti-Semitism—that is, not only the much examined anti-Semitism of the Nazi era but also Jew-hatred in the Middle East, including Iran, and in Islamist ideology and politics as well. Small was aware that there was a hard road to travel because the area specialists who read Arabic or, in the case of Iran, Farsi were almost universally opposed to even posing the question of anti-Semitism in the Middle East. Or, if they posed it, they had a ready answer to its causes—namely, Zionism and then the existence and policies of the state of Israel. But, before getting into that issue, let’s assess the stated reasons Yale decided to close YIISA down. Officials cited a lack of scholarly accomplishment. I am not in a position to fully assess the week-to-week functioning of YIISA or its ability to combine the policy focus that accompanies the examination of global anti-Semitism with the conventional scholarly mission of a university, but I found Yale’s justification for the closure odd. After all, Charles Small invited an impressive group of scholars from outside Yale to speak at YIISA. They included the political theorist Michael Walzer; historians Deborah Lipstadt, Benny Morris, Robert Wistrich, Moishe Postone, Paul Lawrence Rose, and myself; political scientists Bassam Tibi, Jytte Klausen, and Dina Porat; and the philosopher, Elkanan Yakira. One can take issue with what these scholars have written, but this group represents considerable scholarly accomplishment, and YIISA’s invitation to them certainly contributed to scholarly discussion at Yale. What’s more, YIISA was a home for doctoral students writing dissertations. Presumably, the year they spent at the center was important for the completion of scholarship on the subject. The faculty’s report also mentioned a lack of scholarly published papers that emerged from YIISA. This strikes me as another peculiar criticism for several reasons. It is not unusual for various centers on campuses to invite speakers who present works in progress or sometimes already published work. And, while the great majority of on-campus talks are not published in scholarly form, YIISA made many texts from lectures available on its website. Which brings me back to the criticisms of YIISA’s focus on anti-Semitism in the Middle East and Islamist ideology, and how these fit into the question of whether the center was sufficiently “scholarly.” The focus on this sort of anti-Semitism meant that, from the start, YIISA was sailing against the prevailing winds in the academy. Once Mahmoud Ahmadinejad threatened to wipe Israel off the map while Iran was pursuing nuclear weapons, the Jewish community and Israel’s non-Jewish supporters in the United States reacted with understandable alarm. This magazine and some of the editors of The Washington Post have also focused on the threat from Iran. But it is a fair statement to say that, in recent years, however unpleasant American scholars think Iran may be, it is the policies of Israel that have been the primary target of much academic opinion. So, then, a great deal of criticism was pointed at an August 2010 conference at YIISA on “Global Anti-Semitism,” in which I participated. The PLO’s representative in Washington publicly denounced the event as hostile to the Arab and Islamic world. But that could not be further from the truth. While there, I spoke on a panel with several other people, including Menahem Milson, the director of the Middle East Media Research Institute (MEMRI). As many readers of TNR know, MEMRI does a remarkable job of translating Arabic and Farsi texts into English and posting them on its website. It also monitors TV broadcasts from the Middle East and Iran. In his presentation on our panel, Milson showed the most revolting and appalling anti-Semitic propaganda that I have seen since I did research for my recent books on Nazi propaganda. The selections came from Al Manar, Hezbollah’s TV channel, as well as from Arab TV programs in Egypt. They included depictions of the blood libel (that is, Jews killing young children to use their blood to back matzoh on Passover); “teachers” informing young children that Jews were descended from “apes and pigs;” and a litany of Holocaust denials and updated versions of the Protocols of the Elders of Zion. Hardened as I am by many years of research on Nazism and the Holocaust, I too was taken aback by one clip in particular. MEMRI entitled it “Egyptian Cleric Amin Al-Ansari Justifies the Holocaust, Airs Footage, and Declares: ‘This Is What We Hope Will Happen But, Allah Willing, at the Hand of the Muslims.’” It was broadcast on Al Rahma TV in Egypt on January 26, 2009, meaning it was during the Mubarek era when political repression of Islamists coincided with tolerance for expression of their views in the media. (You can view it here.) The clip shows now familiar documentary film of Jewish corpses in May 1945. Al Ansari, far from denying the Holocaust or reducing numbers, expressed glee, yes, enthusiasm about the murder of the Jews and said, “This is what we hope will happen, but Allah willing, at the hand of the Muslims.” In short, it was a celebration of the Holocaust and a desire that it be repeated. It is also horrendously upsetting to see. One reaction is to turn away and to express anger at the messenger, in this case, Milson, and Charles Small for inviting him and giving him a platform. For those convinced that Israel and its policies are the fault of all or most of what has gone wrong in the Middle East, the temptation is to refrain from looking at such hatred straight in the eye or to denounce its presentation as a form of Israeli propaganda. One result is to rhetorically shoot the messenger, deny his scholarly contribution, and describe such work as “politicization.” But, in fact, finding and transcribing such documents is very serious scholarly research—by Yale’s standard or any other university’s. The award to Sansal expresses a determination among some German intellectuals to foster an honest reckoning with anti-Semitism in the Middle East and Islamism—its historical origins and its impact on the world today. 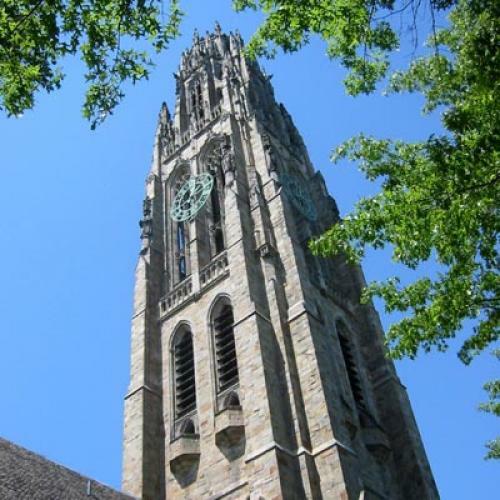 Similarly, there are initial signs that Yale’s reconstituted Program for the Study of Antisemitism possesses a similar determination and will continue to pursue the study of these issues. But, as the Yale faculty and faculty at other research universities reflect on what to do next in this field, questions about scholarly double standards deserve examination. First, continuation of the current situation of great interest in some forms of racism and anti-Semitism but less interest in others amounts to establishment of a tacit double standard. Yale’s historians have made significant contributions to the history of white racism, slavery, and its aftermath, efforts that continue at the Gilder-Lehrman Center for the Study of Slavery, Resistance and Abolition under David Blight’s able leadership. Furthermore, American historians have made major contributions to scholarship on Nazism and the Holocaust. Indeed, the standard applied to scholarly examination of white racism directed at people of color (provided that these racist views come from white Americans and Europeans, but not, for example, from the government of Sudan) has been harsh and unforgiving. Similarly, the moral rejection and scholarly denunciation of anti-Semitism when it comes from Europe has been equally critical. Yet another standard, one accompanied with excuses, apologia, denials, avoidance, and “contextualization,” surrounds examination of Jew-hatred when its source is Islamist, Arabic, or Iranian. Though the verbal rejection of Jew-hatred exists, the willingness to actually write its history has been done primarily by historians of Nazism, as well as some excellent Israeli historians who work on the Arab world or on Iran. The result is that the advancement of knowledge—the primary purpose of a research university—is being slowed above all for political reasons. Nothing a university does is more important, and often less popular, than advancing knowledge about difficult and serious issues. It is the fundamental moral justification for academic freedom and life tenure for professors. The same standard that has applied to the study of slavery, white racism, and Nazism and the Holocaust should be applied to the study of anti-Semitism as it has emerged from elements of the mix of communism, Islamism, and Arab radicalism of the last half-century. One hopes that Yale’s decision to close YIISA and form a new center will rest on this standard, and that reconstituted initiative will seize the opportunity to support significant advances in scholarship regarding these important issues. The decision by German publishers to bestow their most prestigious award on Sansal is just one powerful signal, among others, that global anti-Semitism and interest in understanding and ending it is alive and well. It’s an important development for my fellow scholars, at Yale, across the country, and around the world to ponder. Jeffrey Herf teaches modern European history at the University of Maryland, College Park. His most recent book is Nazi Propaganda for the Arab World.